We have launched a campaign to help motorists avoid a 'holiday horror show' as they gear up for a summer getaway. A 21 point Summer Holiday Check has been created for our 2,764 members to help keep their customer's vehicles' free from trouble during the holiday season. 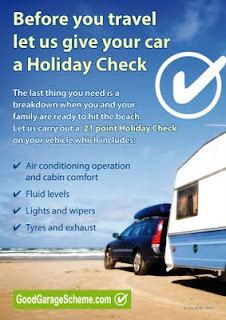 You can find details of the Holiday Check on the Good Garage Scheme website goodgaragescheme.com it covers checking engine oil, brakes, coolant system, tyres and tyre pressure, windscreens, wipers and lights with a further critical check of air conditioning systems. With more people looking to stay in the UK for a holiday this year, more often than not their vehicles become a vital part of their break. All too often though, motorists run into trouble because they have failed to carry out simple checks on their vehicles. For example, if you are towing a caravan or have a boot full of luggage it is essential to look at tyre pressure to make sure you are driving safely. It is also very important to check lights are working properly, including tail lights. Power steering fluid and brake fluid is also another area to look at, especially when you consider how much more work the brakes need to do with the additional weight on board. Statistics have shown that one in three vehicles needs brake fluid changing while around 3.5 million motorists in the UK are driving on illegal tyres. By checking for problems before the holiday season starts Good Garage Scheme members will make sure motorists and their families enjoy a trouble free summer holiday.